Has anyone planted out yet or is it still too early.? I am in South Yorkshire. .. My greenhouses are getting very full , we have some nice weather forcasts so what do others think? I have spent the last 2 days planting out like crazy, if I do not get them in soon, my clay soil will have backed hard. I am in the south-east? Have you been hardening off the plants at all? If so, I'd say go for it! I've put my first batch of plants outside into the coldframes, to harden off. I've spent to many months growing these, not going to start getting all impatient now. I just put my runner beans out! Ten day forecast for our area (Hampshire) has double-digit night time temperatures all the way. I have been hardening them off so fingers crosssed! 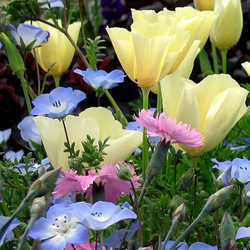 Thank you all for your helpfull replies, I shall start hardening off then get them planted up outside. I usually wait until mid June so can put the plants straight into the boders.But I have done double lots this year of tomato , cucumber , and ,Melon. So along with all the plants its getting a bit swamped.! Like everyone else I'm Keeping my fingers crossed for double digits!!!! !